The issue of period poverty has been making waves in the media recently, after reports surfaced of schoolgirls in Leeds missing school because they could not afford sanitary products. One teenager told the BBC she taped toilet roll to her underwear and missed school “every month” because of her period. Many families in the UK can barely manage to cover costs for food, bills and rent; and the monthly expense for sanitary products is an additional burden. Women who are homeless are most affected- they cannot afford to pay for these products, and they lack the amenities to change their pads or tampons, clean up any leakage, etc. Periods are unfortunately still a taboo subject in society, despite media sites (Buzzfeed, Mic. AJ+) trying to norminalise talk about it. It is a crying shame that period poverty is still an issue in a first world country! The Monthly Gift is a campaign started in July 2015 that aims to make sanitary products (tampons, pads, etc.) accessible to people who are homeless/ experiencing poverty. Donations are forwarded to charities and organisations helping people in need of such necessary (not luxury!) products. It was initially designed to be a week of raising awareness, but two years on, it has gained overwhelming support and continues to grow and grow! Hold your own collection and donate to your local charity! be sure to tag @monthlygiftmcr the picture. There are other campaigns that deal with period poverty as well: @HomelessPeriod_, @nomoretaboo, @FreetobeOK, @everymonthmcr, @CrimsonWaveOrg, @HPLiverpool, etc. If you live in or near Manchester, you can head over to Oklahoma in the Northern Quarter and TMG will help forward them to local charities on your behalf. Alternatively, you can donate to them via GoFundMe. I really want to encourage people who are not based in Manchester to donate to their local charity or food bank too. Poverty is an issue everywhere and as long as there’s poverty in the world, there’s period poverty! A pack of tampons or pads may not cost much to me or you, but to a girl experiencing period poverty, it could mean not being able to go to school for a week. Missing one week out of every four means they are placed at a disadvantage for their studies and it is crucial that we work together to help stop period poverty in the UK! I was recently gifted this duo by my best friend, which she bought during her solo trip to South Korea. These can be bought as a set or on their own, and I’ve included a couple of links to sites where you can acquire them for yourself in this post. These two products claim to help to improve the elasticity, radiance, and the moisture of your skin with egg white and yolk extracts-I used to use egg whites on my nose and cheek area to tighten/firm, and these products ought to work the same way. I’ll see if they really do hold up to their claims! The Egg Mousse Pack: a whipped foam facial mask made from egg white and egg yolk extracts- smoothens and brightens skin. Out of the two, I was least impressed with this one. It left my face feeling soft, but I wouldn’t say it was any more hydrated or radiant than it was previously. I wasn’t really a fan of the smell, either. It smelt like grapes for some reason and I felt a mild tingling sensation. I tried two ways of applying, since I looked up reviews after my first application and apparently it is recommended that you continue to massage the mask in instead of applying and leaving it on (like a scrub). I didn’t notice any difference, honestly. The Egg Mousse Soap (facial cleanser): A whipped egg white mousse cleanser infused with egg yolk extract that gently hydrates, purifies, and replenishes your skin. I liked this a lot more than the mask pack. Like the mask, the nozzle dispenses dense, white foam. I liked the scent a lot more, but you should be warned that like most of the products Too Cool for School has, their fragrance is quite strong. If you are someone who dislikes scents in anything skincare-related, I would advise against getting it. The dense foam meant that I could easily reach awkward crevices and such, which I usually have to use a brush or foaming net to do. The nozzle dispenses a tad bit too much foam in one pump if you’re not careful, so use a light hand. I rub in and massage, and my skin feels soft and supple afterwards. It is not a heavy duty cleanser, and I use it after removing all my makeup (certainly does not budge my waterproof mascara much). I like that my skin does not feel uncomfortably tight like some cleansers leave me feeling, but I would not say you can entirely do without moisturiser altogether. Use your regular toner/ serum/ moisturiser after cleansing. I am currently using the botanical toners from Garnier’s SkinActives range, which I will introduce in my August favourites at some point. I follow up with The Body Shop’s Vitamin E moisture cream (review here). 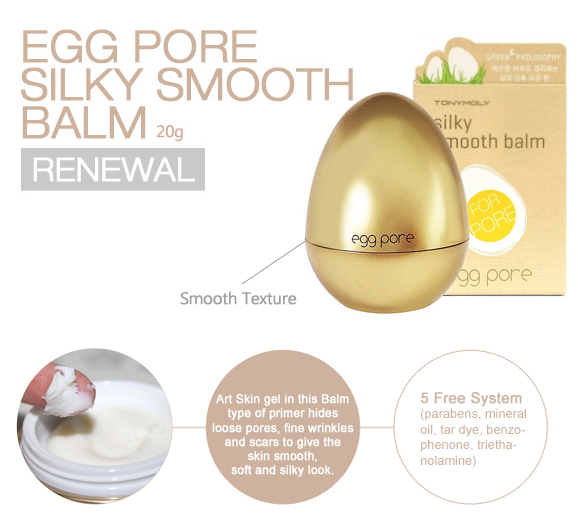 I have also used Tonymoly’s egg pore range, of which I still use the Egg Pore Silky Smooth Balm (review here). I wasn’t that impressed with the Tightening and Cooling pack or the Blackhead Steam Balm from the same range- but then again, I do not have very visible blackheads. The steam balm and smooth balm smells lovely, which is a huge plus for me since I have to leave it on my face for a while. If you live in Singapore, you can buy the whole range on Qoo10 here ($5.99/$8.99 SGD). I have also tried the Skinfood Egg White Pore Foam (150ml), which I wouldn’t say particularly impressed me. It was a cleanser that did its job, but that was pretty much it. It was a little drying, but probably more deep-cleansing than Too Cool For School. I’m so so happy with this ?? definitely recommend! Think I got it on Amazon UK for £5+ so it’s VERY affordable. I’ve tried Smashbox primers over the same Estee Lauder foundation and it didn’t work out either ? and this is literally 1/4 the price and works so much better!